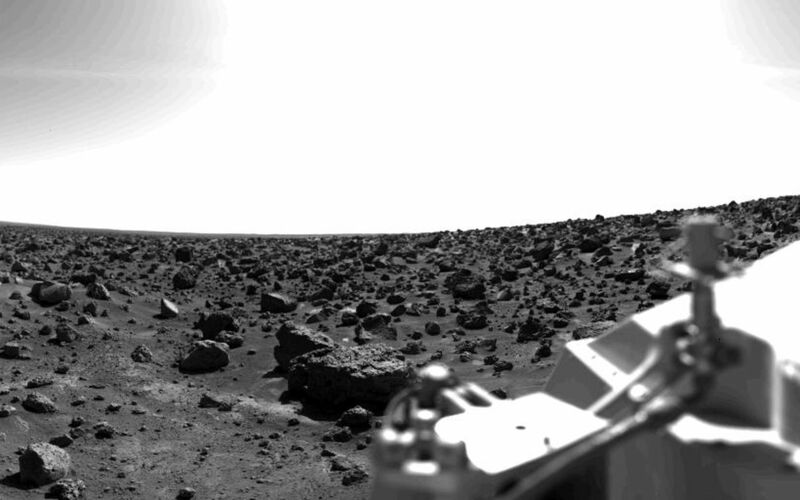 This rocky panoramic scene is the second picture of the Martian surface that was taken by Viking Lander 2 shortly after touchdown on September 3 at 3:58 PM PDT (Earth received time). The site is on a northern plain of Mars, at about 48 N. Lat., 226 W. Long., known as Utopia Planitia. The picture sweeps around 330 degrees in azimuth, starting from northwest at the left through north (above the sampler arm housing) past east, where the sky is bright at the center, and southeast toward the right above the radioisotope thermoelectric generator cover. The surface is strewn with rocks out to the horizon, ranging in size up to several meters across. Some pitted rocks resemble fragments of porous volcanic lava. Other rocks have grooves that may have been eroded by windblown sand and dust. Although fine-grained material is seen between the boulders, no sand dunes are evident. The dip in the eastern horizon at the center is an illusion caused by an 8-degree tilt of the Lander toward the west. 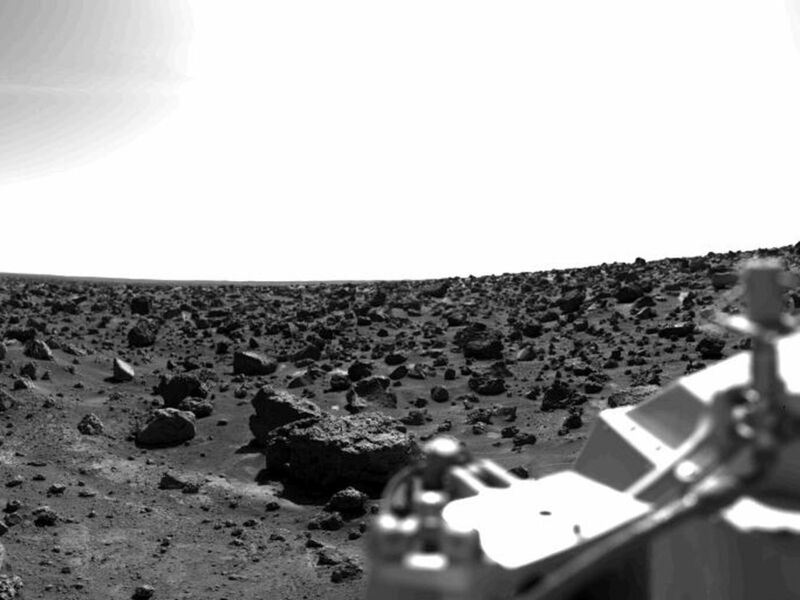 Actually, the terrain is more level than that at the Viking 1 site. The horizon toward the left of the panorama (northwest) appears featureless, indicating that it may be several kilometers distant. The sky at the center (east) is bright because the sun was above but out of the picture at 10 AM Mars time. Toward the right (southeast), the rocks that are silhouetted against the skyline indicate that the horizon is much nearer, probably because of a slight rise in that area of the terrain. The circular high-gain antenna at the right has clots of fine-grained material adhering to the lower half, some of which appeared to have been sliding downward while the camera was scanning the area. At the extreme right, the banded appearance resulted because the camera continued to scan while it was no longer moving in azimuth. Any motion or other variation in the scene would show up as a change in successive lines.